This tutorial is an instructive walkthrough of how I created “Alien Landscape” including details about paints, brushes, palettes and acrylic painting techniques. 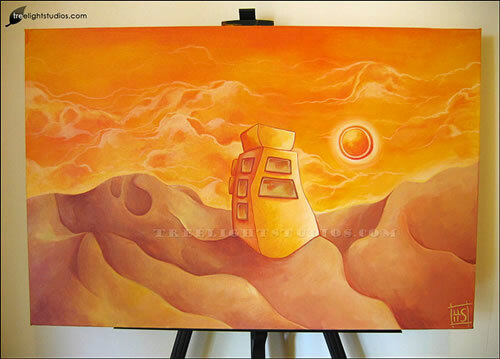 The painting was created with Atelier acrylics on a 20″x30″ gallery-wrapped canvas. There’s a few images here so you may need to give them a minute to load. This is the finished painting, I’m unusually attached to this one and it remains part of my personal collection. Scroll down to see how it was made. First a quick look at my workspace… it’s a little crowded I know but it does the trick. I always try and work with my canvas facing natural light, and I have the overhead light switched on too to get a realistic idea of how my painting will look when it’s hung on a wall. 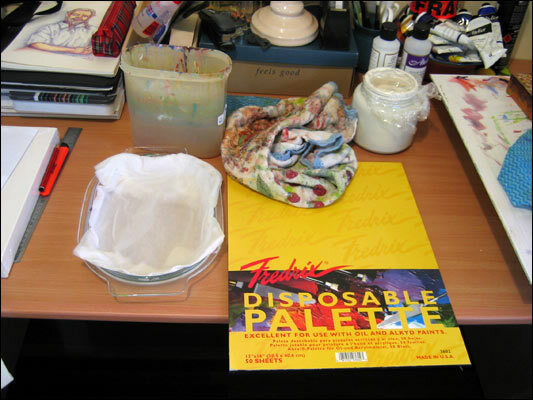 Here’s most of the materials I use – a water container for my brushes, an old tea towel to wipe the brushes, white gesso to prime the canvas, my home-made palette, and some very useful disposable palette’s which are real time-savers when it comes to cleaning up. 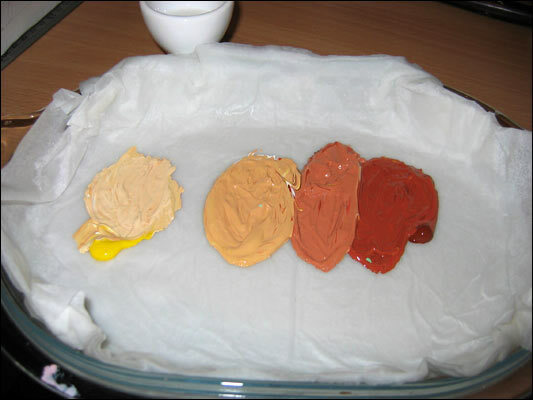 I’ve tried a few different palette’s and this one works the best by far. I’m just using the lid from a glass casserole dish and I’ve folded six sheets of paper-towel (Handi ultra-absorbent works well), run them under water (squeeze out any excess) and pushed them into the contours of the dish. Then I get one of my disposable palette’s (cut in half) and press that onto the paper towel. 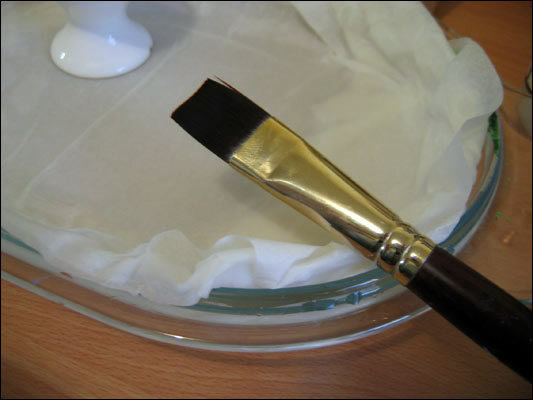 The wet paper towel keeps the palette cool so that your paints won’t dry out too quickly, and the best bit is that when you’re finished you can just throw everything but the dish straight in the bin, which is much easier than scrubbing off paint. 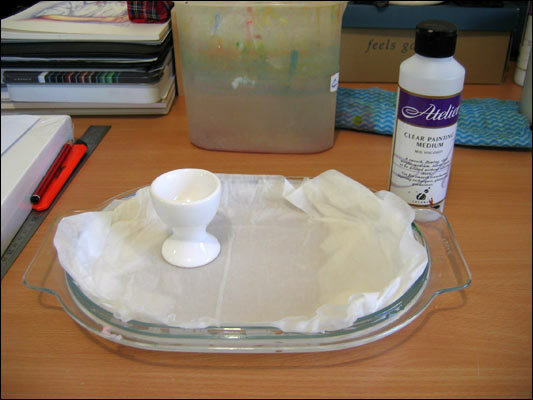 I also use an egg cup to keep my painting medium (right) separate from my paints. 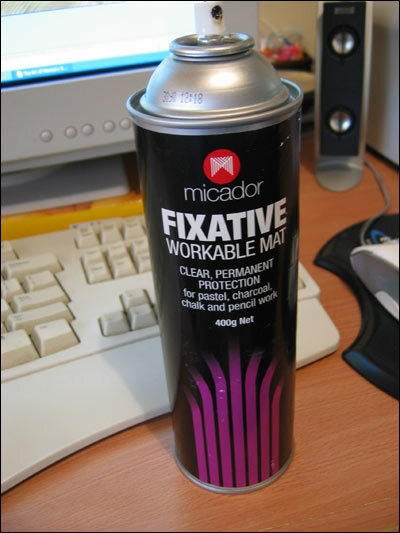 This is the brush I used for most of the painting. It’s my favorite brush, a Windsor & Newton size 18 Galeria (bright shape, sable bristles). Onto the paints. 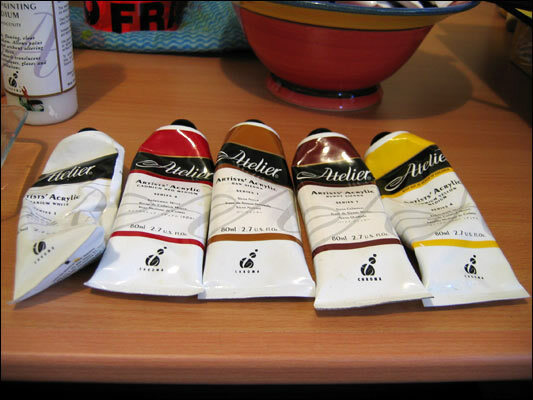 I use Atelier acrylics which are professional artists acrylics produced in Australia. They have a beautiful, thick, oil-like consistency and produce fantastic vibrant colors. Now to the canvas. 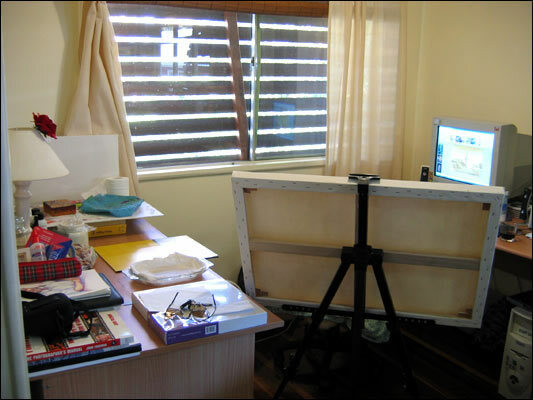 I’m using a 20″x30″ gallery-wrapped canvas (no staples on the side) and it’s already been primed; however for good measure I paint another two coats of gesso onto it as I’d rather the canvas absorb the cheaper-to-replace gesso than my acrylics (learn how to apply gesso). 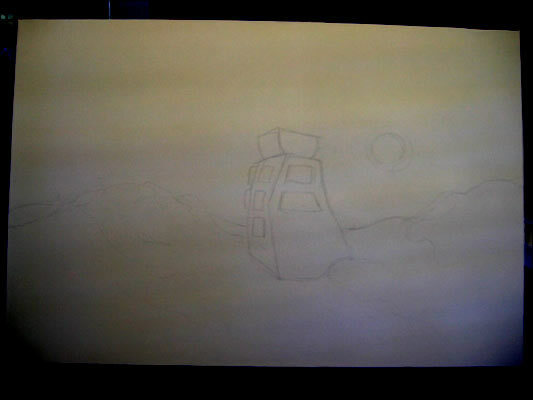 I sketch a light outline directly onto the canvas using a 4B pencil. I then seal the sketch with a coat of fixative. You will still find you get a little bit of smudging if you’re painting over pencil, but the fixative will minimize that. Then it’s time to start painting! I’ve mixed up my base color with a bit of acrylic medium to make the paint go further – the important thing to do at this stage is to make sure all the white canvas fibres are covered by the paint. The actual base coat doesn’t have to be really thick as you’re going to paint over the top of it anyway. 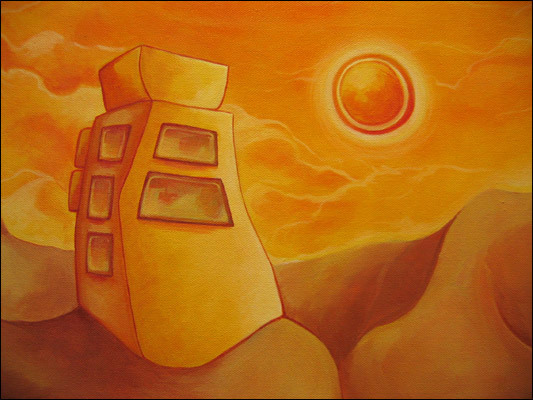 Using this method I paint the sky, and the highlights on the building and hills. Before adding more color I wave a hair dryer over the base coat for a few minutes until it’s touch-dry. I do this because if acrylics are half-dry when you start to paint over them you’ll get all sorts of sticking and flaking problems. 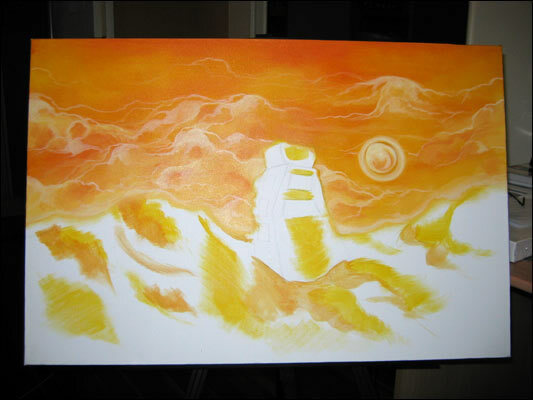 I build up the base colors by adding more yellow, red and orange and blending them together with a large round sponge brush. 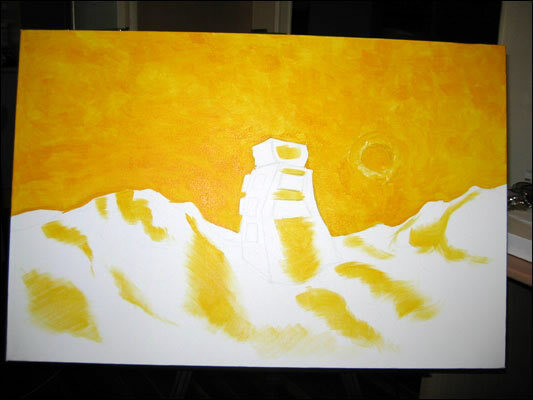 Then I start adding clouds using my normal brush and a lighter shade of yellow. 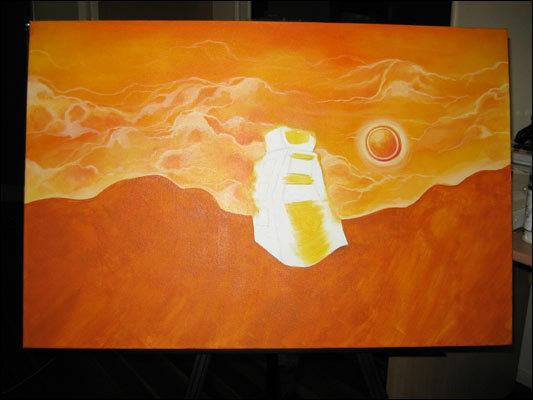 I add vermillion shadows to the clouds and finish painting the sun. Here’s a close-up of the clouds. My next step is to create the base for the desert. 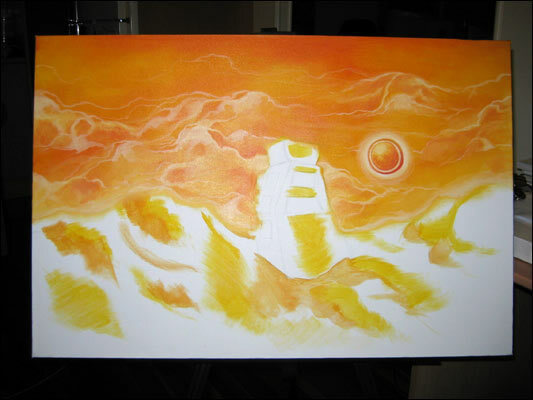 Like the sky I add highlights and shadows and blend them together using the sponge brush. Also, like the sky, I’m using a bit of medium with my paint so that it doesn’t dry out too quickly, and I work fast with the sponge brush to make the colors blend into each other. When that’s done I take a little brush and mark out where the highlights will appear. 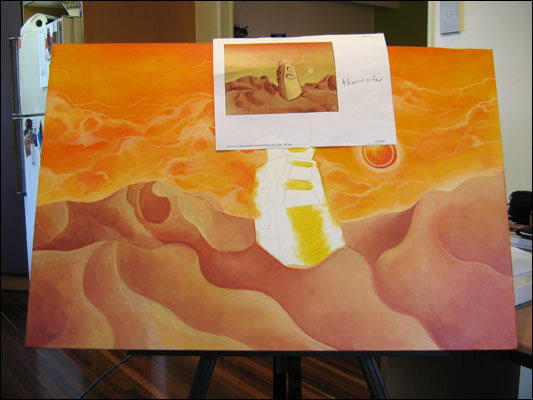 Since acrylics tend to dry quickly I mix up the colors I’ll be using for the desert before I start painting it. 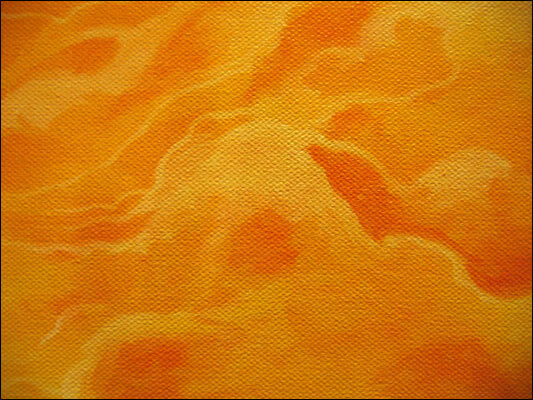 I paint the desert hills by starting with the lightest color, cleaning my brush on a rag, and then moving to the next lightest color, etc. By working fast you can get a nice gradient effect. 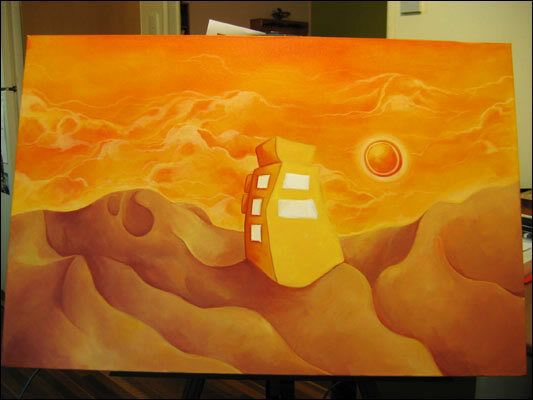 The desert still looks a bit flat and unrefined so I continue to add highlights and shadows until I’m happy with it. Then it’s time to start on the building. I begin by laying down my base colors (the building is metal reflecting the sun and sky so the colors will match), and adding a few shadows and highlights to one side. I do the same on the lighter side and paint in the windows. I want them to look like little jewels so I add a bit of grey and green to my reds and yellows. 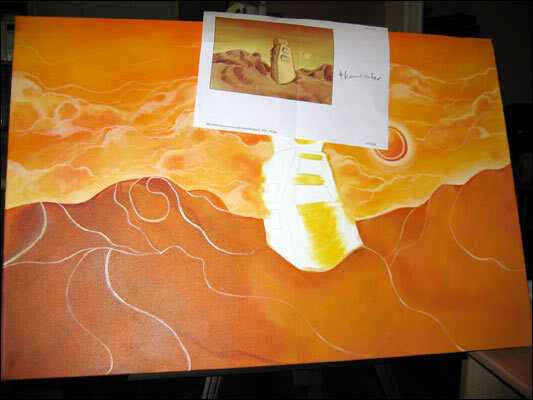 I double-check the sides to make sure they match up with the front of the painting. I think painting around the sides adds an extra element of refinement to your canvas, and it means you or your customer can bypass framing if you like. And finally… it’s finished! I sign the piece, attach hanging wire to the back of the canvas, and it’s ready to go on a wall. I hope you enjoyed this acrylic painting tutorial. If so, why not leave a comment in the box below. Thanks for stopping by! i really like the work posted and was hoping are there instructional dvd’s for sale? I am not sure if this particular artist offers any instructional dvd’s for sale. I wrote a post a few days ago about an art instruction dvd supplier that I highly recommend. i’d like a little more information about your blending technique using sponges. 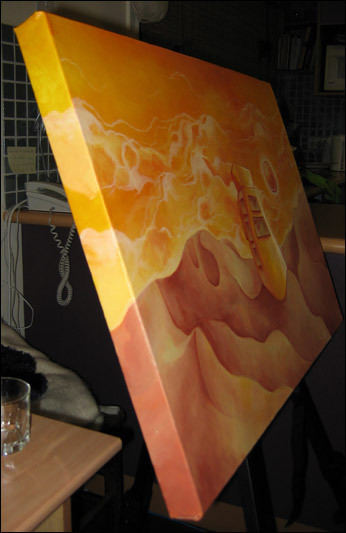 Do you put any sort of sealer on your acrylic paintings? Matt or Gloss? Wow, I like those techniques. Was looking for an instruction of how you build images with Photoshop, layer by layer, but this is the real thing. Still it reminds me a bit of the digital techniques.. This was a wonderful read, I enjoyed both the course and the painting very very much. It’s amazing how much you can learn in just a few minutes! Thank you for creating this explanation! 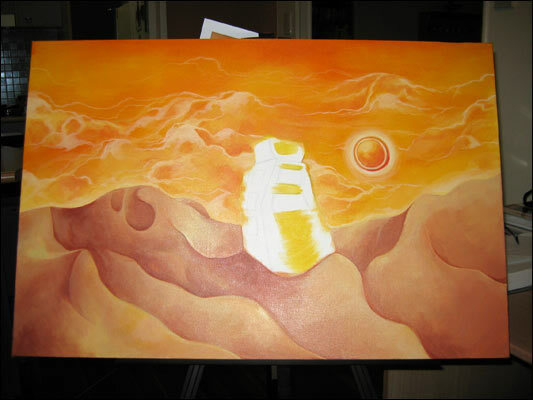 this inspired me alot,..i hav decided to start painting again..GREAT WORK! Thank you for sharing your process, art and such very good teaching. I enjoyed each so much. I’m just beginning to paint and, you really taught me a lot. Thank you! Thanks for sharing this very interesting tutorial. I hope to try this real soon. I live at the Namibian coast where we have lovely dunes and I tried a few realistic looking dunes but I love your surreal look! I also battle with sand ripples so maybe this technique will be easier.